Missing teeth can have a wide range of negative effects on your oral health such as bone loss that leads to teeth drifting and a weakening of your overall jaw structure. Not to mention the lack of confidence in your smile. No need to fear though, our dentists can restore your smile back to its beautiful pearly whiteness with dental implants. A dental implant is an artificial tooth root placed into a jaw to hold a replacement tooth or bridge in position. 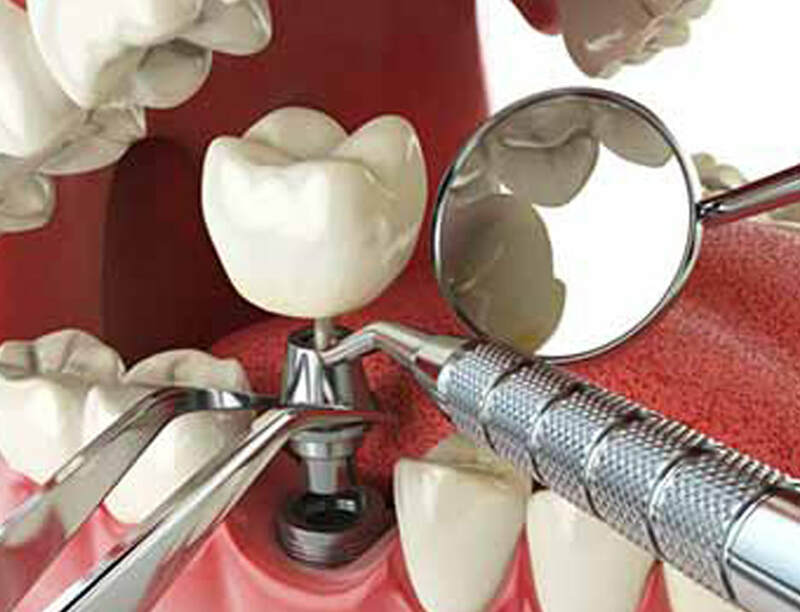 Dental implants don’t affect as many teeth in your mouth as the typical dental bridge treatments do. The implants do not need to be supported to the surrounding teeth as they are implanted directly into the bone. Many of our clients who were unhappy with their smile because of missing teeth often looked to the corrective measures that an implant was able to provide for them. They are very durable and have the potential to last a lifetime with proper oral heath care. Be sure to brush and floss daily just like any of your other natural teeth. Q. How much are dental implants usually? A. The cost is based on what is needed for your specific case. Please take a minute to setup a consultation with our dental team to see how affordable dental implants really are and how they can drastically improve your natually beautiful smile. Q. Can I eat normal food with a dental implant or do I have to cut a lot of foods out of my diet? A. After the recommended healing stage, you can eat as you normally would since it is a permanent tooth and functions just like your existing teeth. You can continue to enjoy all of the normal foods that you used to eat prior to receiving the implant. If you think that you may need dental implants St Catharines has a few dentists who are very good at these types of procedures including the friendly and knowledgeable dentists at Lakeport Dental. If you live in Niagara dental implant & oral surgery professionals are closer than you think. Our team can also provide high quality dentures for patients who require them.